A powerful liquid hand dish washing product that is mild on sensitive skin. 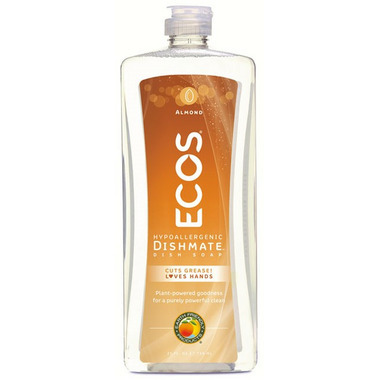 Letters from consumers have told us that Dishmate, and our other Earth Friendly Products are great products for individuals that cannot use harsh cleaning products. Dishmate"s almond and cherry oil based formulation acts as a moisturizer on your hands. The concentrated formula lasts for a long time, and we recommend that you squirt only a small amount into your sponge for cleaning dishes. Dishmate also acts as a great cleaner for hand washable clothes too. Ingredients: Water, Cocamidopropyl Betaine (coconut-based surfactant), Sodium Coco-Sulfate (coconut-based surfactant), Cocamidopropylamine Oxide (coconut-based surfactant), Phenoxyethanol (preservative), Natural Fragrance, Methylisothiazolinone (preservative). No complaints, enjoy the smell and ingredients. Works well, but I have had better brands so thats why I am not giving 5/5 totally worth buying on sale! I prefer the citrus one personally. It smells very nice, but it's not concentrated at all. The best dishwashing product on the market!!! Smells emazing, Make dishes appetizing to use after washing with it. I Highly recommend it. The smell is so great! I love washing my dishes with what smells like Amaretto.